David Bernhardt, President Donald Trump’s interior secretary nominee, testifies during his Senate Energy and Natural Resources Committee confirmation hearing March 28. “The Government of Canada continues to interpret the century-old Migratory Bird Convention as to prohibiting the incidental take (killing or harming) of migratory birds, their nests and eggs,” said Gabrielle Lamontagne, a spokeswoman for Environment and Climate Change Canada. She noted that Canada is analyzing how the reinterpretation of the U.S. law will affect conservation of birds that migrate between the U.S.and Canada. Reveal is awaiting responses from the three other nations that have migratory bird treaties with the U.S.
A retired U.S. Fish and Wildlife official who helped negotiate the amendments to the treaties with Canada and Mexico in the 1990s says Trump’s policy is out of step with international obligations. “I think a good argument could be made that the current Interior policy does not comply with the treaty with Canada,” said Paul Schmidt, a 33-year veteran of the Fish and Wildlife Service who was promoted to assistant director under President George W. Bush. Emails obtained by Reveal provide evidence of how the revision is affecting law enforcement in the U.S. For example, after a pipeline burst in Idaho last April, spilling diesel into a pond and wetland, two coolers full of dead birds were dropped off at the Fish and Wildlife office in Boise. In an email about what to do with the dead birds, a Fish and Wildlife agent wrote that “we are no longer involved’’ when birds are killed in oil spills. Agents had a similar reaction when a tugboat spilled oil into Great Harbor in Woods Hole, Massachusetts, killing dozens of birds. “As this spill involves the incidental take of birds protected by the Migratory Bird Treaty Act, there is currently no enforcement action planned,” according to an email from a Fish and Wildlife agent. Another email from October 2018 shows that Fish and Wildlife saved $2.5 million by not filling 10 positions primarily related to investigating violations of the Migratory Bird Treaty Act. The agency refused to discuss the specific examples or staffing decisions. The Interior Department resisted the documents’ release. The Natural Resources Defense Council, the environmental group that provided the heavily redacted emails to Reveal, had to sue to get them after the Interior Department failed to respond to a public records request. The council is one of several environmental groups and eights states suing to restore full bird protections. There’s a lot at stake for birds, people and law enforcement in this fight. Millions of birds die every year due to waste pits for mines and oil fields, electric power lines, wind turbines, communications towers and commercial fishing. The threat of prosecutions and fines was a powerful tool to encourage industries to figure out ways to avoid killing birds. Oil companies put nets over waste pits. Electric companies separated wires so eagles and other raptors wouldn’t get electrocuted. Fishing crews put weights on the long lines so birds wouldn’t get drowned when they dove for the bait. Many birds were saved. Scientists caution that weakening the Migratory Bird Treaty Act imperils many types of birds that are endangered or declining in numbers, and it also eliminates an important source of wetlands restoration funding: penalties paid by violators. “It will unravel a lot of progress over the past several decades,” said Colleen Cassady St. Clair, a professor of biological sciences at the University of Alberta who has studied the impact on birds of the oil sands industry in Canada. Restored wetlands help bolster fish and shellfish, clean water and protect people from big storms. “Those conservation efforts are benefiting birds, sure. But they’re also benefiting many other species that are using coastal habitats, and they’re also benefiting people,” said Amanda Rodewald, an ornithologist and professor at Cornell University. Doing away with the fines “actually could be putting other communities at risk from storm surges and other negative environmental impacts,” she added. There’s a lot at stake for energy companies, too, which is why they’ve worked so hard to weaken this act. Energy companies fought this policy in court and lobbied Congress and the Interior Department to abandon it. At least one of Bernhardt’s former clients, the Independent Petroleum Association of America, pushed for the change. But Bernhardt did not consider it a conflict of interest to work on the issue. “He’s not at all recused from dealing with MBTA because that’s a broad matter,” Faith Vander Voort, the department’s press secretary, said after discussing Reveal’s questions with Bernhardt. 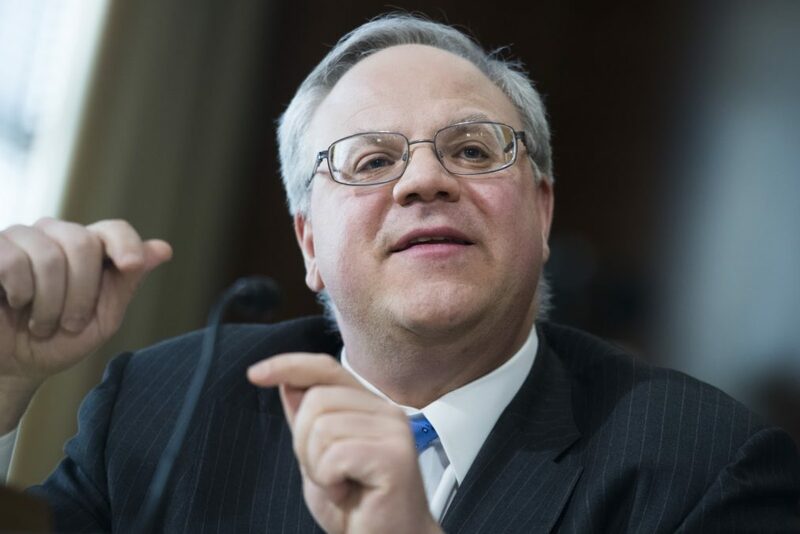 The Senate Energy and Natural Resources Committee voted 14-6 on April 4 in support of Bernhardt’s nomination, and the full Senate is expected to confirm him as secretary. Some congressional Democrats who oppose Bernhardt’s nomination cite his cozy relationship with industries whose profits are affected by decisions at the Interior Department. “This clearly was an issue that his clients had been working to change. And apparently he did their bidding,” said Sen. Chris Van Hollen, D-Md. In the past, companies have paid enormous fines under the Migratory Bird Treaty Act. For instance, in 2010, the Deepwater Horizon rig explosion killed 11 people and triggered an 87-day oil gusher in the Gulf of Mexico. Scientists estimate hundreds of thousands of birds were killed. BP agreed to pay $100 million for criminal violations of the Migratory Bird Treaty Act. That seemed to contradict instructions issued by the Fish and Wildlife Service. In the past, the memo said, the Interior Department pursued “claims against companies responsible for oil spills that incidentally killed or injured migratory birds. That avenue is no longer available” due to the 2017 legal interpretation, known as an M-Opinion. Van Hollen sought clarification, and a Fish and Wildlife official finally responded to him in a Feb. 21 letter. “In practice, the new M-Opinion means that if an oil or hazardous chemical release occurs and is not done with the intent of taking migratory birds, the MBTA does not apply,” according to the letter from Margaret Everson, the agency’s principal deputy director. “(Zinke) didn’t realize this change meant taxpayers and citizens couldn’t hold companies liable under the Migratory Bird Treaty Act for massive killing of migratory birds,” Van Hollen told Reveal. Former agents rue the loss of an important tool to prod industries to protect birds. As a rookie agent for the Fish and Wildlife Service in Alaska 30 years ago, Gary Mowad traveled across Prince William Sound for weeks on end, plucking dead birds from “big globs of oil” spilled from the Exxon Valdez tanker. The Fish and Wildlife Service used that oily evidence from Mowad and other agents to estimate that 300,000 birds were killed in that 1989 spill. Exxon agreed to pay $125 million in fines and restitution for criminal charges, including criminal violations of the Migratory Bird Treaty Act. This story was edited by Matt Thompson, Narda Zacchino, Michael Corey and Andrew Donohue and copy edited by Stephanie Rice.